Dr. Felix Wankel, born in 1902, became a specialist in valve sealing and rotary valves in pre-war Germany, where he worked for Daimler-Benz and BMW. After the war he thought time was ripe to found his own engineering consultancy in Lindau, near Lake Constance, where he began to work on rotary valves and superchargers following his rotary piston principles in 1951. In 1954, NSU and Wankel had found each other, and the small German motorcycle firm started a collaboration which was to last for the entire life of all the firm's Wankel-related projects. The first application was of a mechanical-driven blower for NSU's racing motorcycles of the early Fifties. Then, on February 1st 1957, the first prototype Wankel engine was tested, achieving engine speeds of up to 15,000 rpm. It worked according to a four-stroke cycle and had a capacity of 125 cc. Its main advantages were extremely compact dimensions and, since it had no reciprocating parts, absolutely vibration-free running. But sealing of the three-pointed rotor, as the rotary piston was called, caused some worries. This was to remain the case for any future developments of the Wankel engine.  When news of this sensational power source leaked to the outside world, NSU and Wankel were asked to sell patents to all sorts of engine manufacturers. Around 1960, when NSU had still not taken any Wankel engine to the production stage, patent rights were bought by many manufacturers. They included Curtiss-Wright, Daimler-Benz, Citroën, MAN, Krupp, Deutz, Perkins, Rolls-Royce, Fichtel & Sachs and the still little-known Japanese firm Toyo Kogyo, the manufacturer of Mazda cars. They all began intensive research and development programs, ranging from small motorcycle applications to multi-rotor stationary engines. 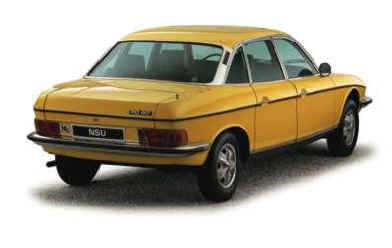 But NSU showed real courage when they decided to actually produce it. The little Neckarsulm firm had entered car production in 1957 with the little rear-engined two-cylinder Prinz. NSU then used the Prinz as the basis for a charming little Coupé, which went on the market in 1960. Called the Sport Prinz, it wore one of Carrozzeria Bertone's most elegant body styles. Bertone had also penned an open spider version of the Sport Prinz, and that car suited the needs of NSU who thought such an exclusive little model was an ideal way to launch the Wankel engine in limited production. Called the Wankel Spider, it caused a sensation at the 1963 Frankfurt auto show. Its capacity was 498 cc from a single rotor configuration, but the international automobile federation had decided to double that figure for better equation with conventional reciprocating engines, so its official displacement was 996 cc. With 64 hp, performance was outstanding - the Wankel Spider would do 95 mph (151 kph) with ease. Fuel consumption was not a strong feature and despite the fact that it could easily do 10,000 rpm and more, engine speed had to be limited to 6,000 rpm since higher speeds would affect the sealing capacities of the rotors. During the Sixties every manufacturer involved tried to gain publicity from Wankel-engine developments, but only Toyo Kogyo was able to follow NSU into production. Its Cosmo 110S model making its debut at the 1964 Tokyo Show. But so far all the Wankel applications had been to existing or conventional car concepts. So when NSU presented the Ro 80 model at the 1967 Frankfurt Show, it really was a show stopper. With very attractive and advanced styling and aerodynamic perfection, the Ro 80 set a trend in design which would last well into the Seventies and beyond. 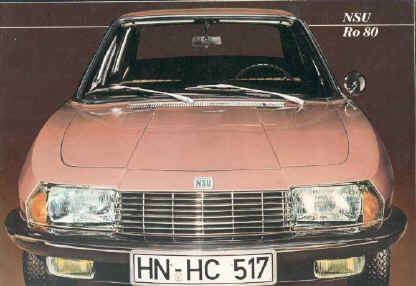 NSU had taken full advantage of the Wankel engine's compactness as the Ro 80's low bonnet shows. Good weight distribution was also an advantage. Despite the fact that it had twin rotors, the low center of gravity of the engine contributed much to the Ro 80's superb handling. The car was rightly voted Car of the Year, since it showed the way to the future. A few other license-holders tried their hand at Wankel-engined prototypes as well, including the sensational Mercedes-Benz C111 in 1969. Citroën also built two pilot series of Ami and GS models with rotary engines, but only the Ro 80 made it, becoming Europe's only Wankel-engined series-production car. Despite the fact that reliability was not its greatest asset, the Ro 80 remained in production until 1976, six years after VW had taken over NSU and incorporated it into Audi. When production of the Ro 80 was stopped, it left Mazda as the world's sole manufacturer of rotary-engined cars. The Ro 80 was a brave look forward in terms of technology and styling. Sadly it failed, but it left its mark. The rotary engine of the Ro 80 was one of the many alternative forms of the internal-combustion engine which litter the history of the automobile industry. In de internationale verkiezing van "Car of the century", die door Ford T gewonnen werd, kwam de Ro 80 op de 20e plaats. Dit is de originele tekst zoals die een tijd op het internet heeft gestaan .